Fiction – paperback; Vintage; 142 pages; 1999. 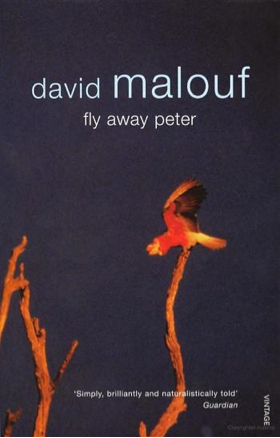 David Malouf is a critically acclaimed and prize-winning novelist and poet from Australia. Fly Away Peter, his third novel, netted him The Age Book of the Year in 1982 and the Australian Literature Society Gold Medal in 1983. It is a truly beautiful and devastating story set before and during the Great War. I read it in two sittings and felt stunned by the sheer power and emotion that Malouf wrings from just 144 pages of eloquently written prose. When Fly Away Peter opens it is 1914. Jim Saddler, a 20-year-old man from southern Queensland, devotes his time to watching birds in the estuary and swampland near the home he shares with the father he does not like very much. One day he meets the owner of the land, Ashley Crowther, a rich farmer not much older than himself, who employees Jim to record the coming and going of the birds — both native and migratory species — as part of his plan to create a sanctuary. A little later Jim befriends an older English woman called Imogen Harcourt, whom he sees in the “sanctuary” taking bird photographs which she sends to a London magazine. These photographs also accompany the long list of birds that Jim transcribes into a special book using his “best copybook hand, including all the swirls and hooks and tails on the capital letters that you left off when you were simply jotting things down”. This trio of characters come from vastly different backgrounds — Miss Harcourt is an English immigrant who lives alone, Australian-born Ashley was educated in England’s finest schools, Jim has never left Queensland — and yet they are united by their mutual love of birds and the natural world. When he talked to Miss Harcourt, as when he talked to Ashley Crowther, they spoke only of ‘the birds’. But their idyllic existence comes to an end when war erupts in Europe and both men decide to sign up — Jim goes to Salisbury, England, to be trained; Ashley is an officer in a different division. It is here, on the battlefields of the Western Front, that Malouf’s extraordinary novel really comes into its own. His gut-wrenching descriptions of the mud and the trenches and the fear of going over the top are eloquent and moving, as is his depiction of the friendships, and occasional personal hostilities, formed on the front line. There is one particularly god-awful scene in which Jim loses his best friend in the platoon, a larrikin called Clancy, that is more horrifying and bone-chilling than anything I’ve ever read about the Great War. Often, as Jim later discovered, you entered the war through an ordinary gap in a hedge. One minute you were in a ploughed field, with snowy troughs between ridges that marked old furrows and peasants off at the edge of it digging turnips or winter greens, and the next you were through the hedge and on duckboards, and although you could look back and still see farmers at work, or sullenly watching as the soldiers passed over their land went slowly below ground, there was all the difference in the world between your state and theirs. They were in a field and very nearly at home. You were in the trench system that lead to the war. It’s easy to see why the novel is a set text in many Australian schools. It explores the myth of the Australian soldier and the ANZAC spirit, and contrasts the horror of war with the beauty — and peace — of the natural world. It shows how an appreciation and respect for nature is a great leveller, crossing the boundaries of race, class and experience. And the text is rich with symbols, not least the migratory birds which represent Jim’s “flight” to the other side of the world. But it is the poignancy of the ending, in which Miss Harcourt stands on the beach and reflects that life continues to move on — “Everything changed. The past would not hold and could not be held” — that elevates this novel from excellent to exceptional. Wow! That definitely sounds like my cup of tea and this book is now going onto my wishlist. The only Malouf I’ve got is Remembering Babylon. I don’t think I’ll get to it before the end of January, sadly (have to start Vanity Fair for next months’ Classics Reading Group). Have you read that? Would you recommend it? I finished My Brother Jack last night and loved it. I think it’s one of those books where I wish he’d written a couple hundred pages more. Davy’s transformation, his journey and the relationship with his brother, father and mother were really fascinating to read…I wanted more of their story. Really good read, Kim, many thanks for pointing me in its direction. Oh Kinga, I did think of you when I wrote this review, because I know how much you like WW1 novels! I read Remembering Babylon when it first came out, but I can’t recall the first thing about it. I do like Malouf’s work — The Great World (about WW2) is especially good. And I’m so pleased you liked My Brother Jack! There are two more in the series, which I read, but I found them disappointing, so wouldn’t necessarily recommend them. This one is very short, but boy, is it powerful! I’ve read Remembering Babylon, The Great World and Johhno, but I feel the need to read more by Malouf! Funnily enough I found a copy of Fly Away Peter in a bookstore in Dublin, going for €3! My bookclub are reading this as our May book. I’ve just finished it in one sitting. Exactly as you described above. Devastating, but so beautifully written. It’s probably the best book I’ve read this year. Isn’t it a great book? I usually give my books away to charity shops, but I’ll be holding onto this one, as I think it deserves a re-read at some point.